About a year ago, I let slip something “personal” about NPY to his friends. He likes strawberry. As much as he protests, his ears perk up if he hears of a strawberry variety of something. As much as he protests, he keeps proving me right, and look what he picked up at Shoppers recently! I never liked strawberry ice cream and try quite hard not to enjoy it too much although now I get more exposure to it via NPY. 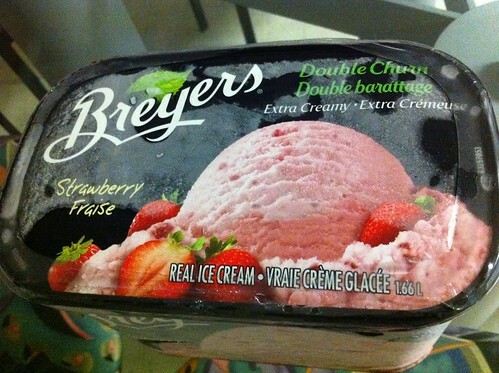 It helps because if our freezer is constantly stocked with ice cream, I can resist if it is strawberry! Lil Sis’ tasked me to make dinner which was just to boil some Korean potato noodles and mix it all up in a pan with yesterday’s stir-fry, adding some sesame oil and hoisin sauce. The whole task reminded me of why I do not cook except in my own kitchen and for people with on-par or less experience than I have in preparing food. I almost dipped tongs into boiling water instead of wooden chopsticks, the water pot element was too high, the skillet element was too high, why don’t I know where utensils are located by now, why did I use that knife, I didn’t add enough hoisin sauce or sesame oil, and I mixed the noodles and stir fry too delicately! My philosophy is that it all comes out tasting moreorless the same. And I have heard people say it and I cringe every time, “it comes out the same way.” It just reminds me of how around the naturally cooking-adept people in my family, I never bothered to make anything and buried my head in a book or at the computer. Previous Post Best Things to Eat and Drink in Vancouver 2011–what have you tried?